Discussion in 'Henshin Justice Unlimited' started by Toku Prime, May 19, 2018. So the subs for this movie have started to be released and the immediate reaction I'm seeing on social media is that it's actually surprisingly good. Toei managed to do a crossover movie that actually has a coherent plot and has returning characters that contribute instead of just being more bodies in the fight. Is it perfect? No. The villain really isn't that fleshed out. And there's been some surprise at the end montage of still images taken from the participating Riders' series, because they've carefully removed Yuuki from all the Fourze images (likely because the actress made negative public comments about her time on the series). But overall it seems to be one of the best received toku crossover movies, so I thought I'd ask what people thought of it? I highly enjoyed it. It spent more time developing its plot and characters than just having pointless action scenes and fan service. It also helped because when there was fanservice it made it far more enjoyable with a great payoff. The only two nitpicks I have include it resolving nothing with Foundation X and I really wanted a post credit scene of Shotaro showing up and saying, "Crap, we missed it." Although, I'm a little confused as I thought Ghost, Ex-Aid, and Gaim were all in their own universes. I mean, I guess Kouta could easily travel between dimensions now that he is a god, but what about the former two? Oh, and who was the dude cospalying as Brooke from One Piece? Is that the second rider from Ghost? Best scene was when they were all saying their catch phrases and arguing over who was going to lead the charge. It's funny, OOO wouldn't be in my top 10 Rider series nor was Ankh my favorite character from that show (Date FTW!) yet him coming back and Eiji transforming into OOO was a highlight and I was sad Ankh didn't get to stick around. Also that bike-based action scene might be the longest some of them have ever had. It's very much on the record that I don't care for Foundation X so I didn't mind that they were completely glossed over. Though admittedly it makes Foundation X's appearance in the Brave special make no sense. Although, I'm a little confused as I thought Ghost, Ex-Aid, and Gaim were all in their own universes. Ex-Aid appeared in Ghost's final episode and all three were in the previous "Heisei Generations" movie. In this movie Takeru (Ghost) mentions wanting to repay Emu (Ex-Aid) for saving his life, which refers to the last scene of that film where Takeru has a heart attack for seemingly no reason and Emu had to resuscitate him. I think the parallel world stuff was there just so they didn't have to explain why the Sky Wall wasn't in the previous Rider series even though Build insists it's been around for 10 years. No doubt in future crossover films Build will appear without explanation. Oh, and who was the dude cospalying as Brooke from One Piece? Is that the second rider from Ghost? Oh, you mean Onari. No, he's not a Rider. He was the bald Buddhist monk who acted as the comic relief character in Ghost. At the end of the series the writers thought it would be funny for Takeru to declare that ex-villain Javert was the new master of his dad's temple (seemingly just to screw Onari over for the lulz). In the post-season V-Cinema 'Kamen Rider Specter' it's shown that Onari has quit and is working as a detective, and for some reason is dressed like that (I assume it's a reference to something I don't understand). So the outfit (along with his reconciliation with Takeru at the end) fits with continuity but I suspect the real reason he's wearing it is that the actor has probably grown his hair back since Ghost finished filming and the wig from this outfit disguises that. Wait, that was the annoying monk dude? I will say that this movie makes me want to watch Ex-Aid sooner rather than later. It's funny, both this site's HJU Radio and The Tokusatsu Network's podcast have done episodes on Ex-Aid and had very different takes on it. Keith Justice and co enjoyed it while team toku net were not so impressed. I guess it depends on your own preferences. Personally I think it was flawed but still enjoyable, and a big improvement over the previous two years. All of Phase 2 Heisei is in the same universe. Build might be problematic though given its setting. Well the movie already establishes that Build is in its own universe just like Gaim did at one point. Where did Gaim state it was its own universe? Another example of the constantly flip-flopping continuity. Wizard's final two episodes saw him cross into another dimension for an adventure with Decade and the other previous Heisei Riders. Gaim also crossed dimensions in order to make a pre-season cameo. Later on in the Gaim and Wizard crossover movie, each of them once again travels through dimensions to another world in order to encounter each other. Just off the top of my head, I can't recall anything that would definitively prevent them from having both started from the same dimension, but the way those encounters were presented very much made them seem like they were coming from different worlds. Finally found the time to watch this movie. Overall it was enjoyable. I liked it more than the first Heisei Generations movie that featured Ex-Aid, Ghost, Drive and Wizard. It was very nostalgic at this point to see OOO, Fourze and Gaim's actors to return in person. I would of liked to see the Legend Riders have some more screentime and involvement but maybe the budget and the actor's scheduling got in the way of things??? I wouldn't even try to make sense of the timeline and universe of Kamen Rider at this point . I liked that it once again ties in with Foundation X. But where was W?? Foundation X was originally Double's villain. As of this review, Build is nearing its final arc and we haven't gotten that Double and Build dream crossover. The interaction between Sento and Philip would of been gold. That's disappointing. If this is indeed the final Movie War of the Heisei Phase 2 era than Double should of appeared more than any Rider. He was the one that started it all. The one thing that will always be memorable about this movie is that we finally got the Eiji/Ankh conclusion we've been waiting for since the end of the OOO's TV series. It was good to see that reconstituting Ankh's core medal is not impossible after all. 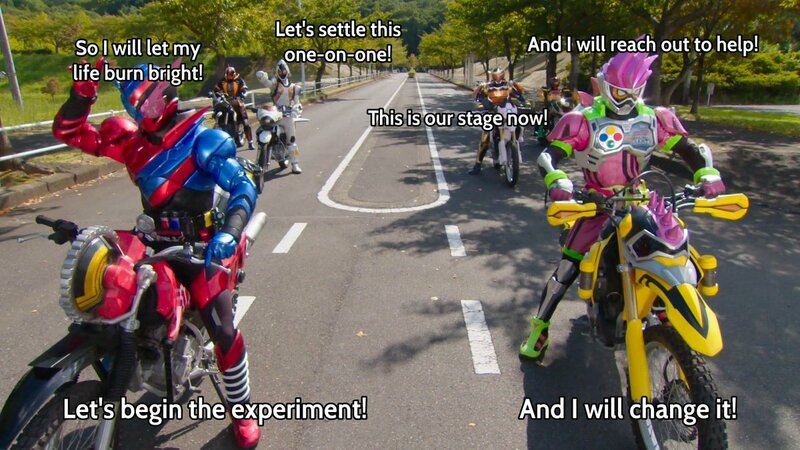 Well, that and all the times the main Riders were in character around each other. I'm still trying to make sense of the Kamen Rider multiverse. Decade will always be the biggest wrench that was thrown into the works, but I'm slowly beginning to make sense of that monstrosity. And if I can put the pieces of that together, Neo Heisei is not so bad. So far, I'd say it's interesting that Build is part of his own self-contained world and is not part of any primary Kamen Rider world (as far as we know). But again, Toei can never make up their mind if they want all of this to be part of one united continuity or not, so I look forward to when another crossover retcons this alt-universe detail about Build.